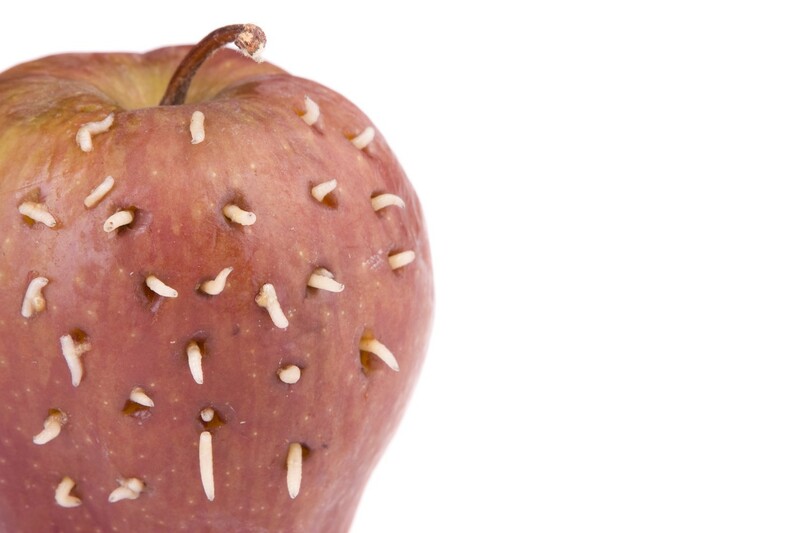 Apple Maggots are tiny worms which tunnel through apples any other fruit causing damage and rot. The adult stage is a fly which is just about as large as a common house fly. Apple Maggots appear throughout much of the world and though they prefer apples, they will take advantage of just about any fruit which can be had. This article will detail some basic biology of Apple Maggots and then offer control options and treatment methods. Apple Maggots are an insect which feed off the ripe fruit of plants and trees. And they just don’t target apples. Common fruit they have been known to infest includes plum, cherry, apricot, pear, pyracanth, blueberries, strawberries and just about any plant which produces a sweet full bodied fruit on which to feed. The life cycle of the Apple Maggot starts in the spring when over wintering pupa hatch out adult flies. These males and females won’t mate immediately; instead they will seek food in the form of honeydew and sap from local plants and trees. After a week or two of foraging and eating they will mate. Females will start laying eggs within a month of becoming active. The placement of eggs is generally done just under the skin of host fruit. Females will lay eggs for the rest of her life – which is the rest of the growing season – on targeted fruit which will be able to feed her young. The placement of apple maggot eggs, known as a “sting”, will damage host fruit as will the eating and tunneling young. Larva hatch in 1-2 weeks, depending on local conditions, and will feed on the host fruit till it is ripe and falls to the ground. The over ripe rotten stage of host fruit seems to be the sign for larva to exit. Upon crawling out of host fruit larva will enter the ground and begin to change their skin to a thick pupa casement which serves them throughout the winter as their puparium. The following year these same larva will be fully developed pupa and hatch out as flying adults ready to start the cycle all over again. Apple maggots begin their activity in early spring throughout the southern states and as late as July in the northern growing zones. However, activity has been found on so many different host plants it is best to monitor throughout the growing season to insure you don’t have any finding their way onto other types of plants. It was once thought Apple Maggots were only active in late summer/early fall as apples reached maturity but this is not longer the common belief. 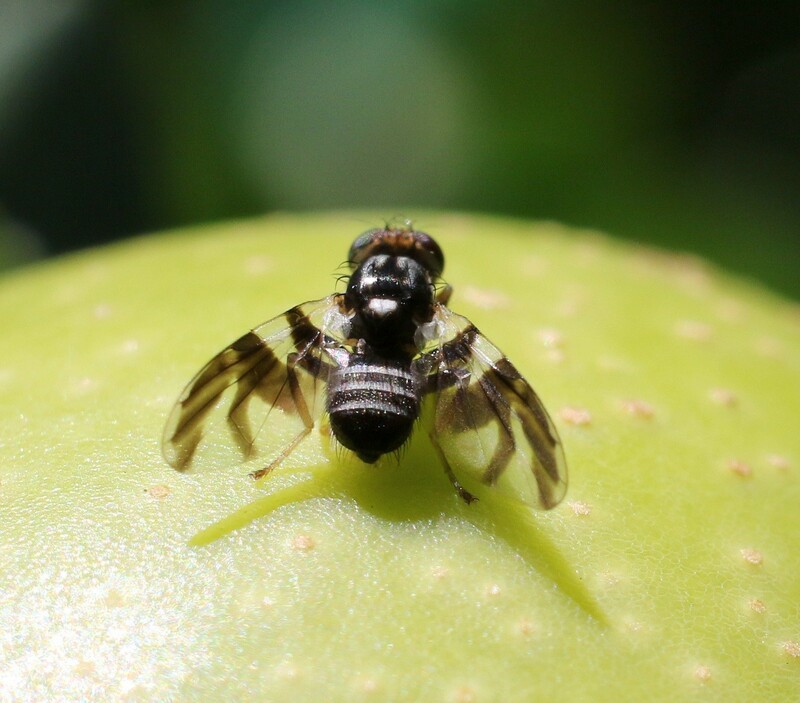 Due to the wide range of fruit crops on which apple maggots can feed they have become more of seasonal pest which can be active any time of the year as long as there are some types of host fruit on which they can feed. For this reason apple growers must be all the more concerned and monitoring local populations to keep a vigil eye. Furthermore, if you are growing any type of plant which has had activity and damage in the past, it is best to monitor local levels so that control methods can begin at first sign. This is key due to the fact that once eggs are laid there is not much that can be done to stop fruit damage. Since eggs are laid inside the fruit, liquid treatments won’t have any impact on larva which are protected by the host fruit’s skin. 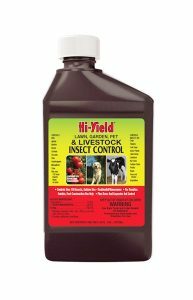 This is why liquid treatments should start once activity of adult flies has been detected. Since adults won’t start laying eggs for some time after they first hatch, it is possible to keep their cycle in check by killing off the first hatching of adults. These adults tend to target host plants and trees, focusing on the same plants and local area from year to year. If you have had problems with Apple Maggots in the past, there is pretty much no doubt you will develop them again. The key to breaking a local infestation is getting the first stages that emerge each spring. This used to be much easier when they were only active for short periods of time but since apple maggots have become a more urbanized pest, their increased level of activity has proved to give them a built in defense. Now the best you can hope to do is to first detect local activity and take immediate action once you know they are out and about. However, the window of opportunity for apple maggots appears to be as large as ever so therefore all treatments and monitoring programs implemented must be maintained with a new level of persistence. A month or two of pro active apple maggot control won’t do; apple maggots are clearly a pest which can appear at different times on different plants and for this reason you need to be ready for when they make their seasonal appearance. As described above, apple maggot pupa will hatch every spring even though local plants and trees may not have any adult ripe fruit on which their young can feed. Since many regions of the country have new types of plants which may develop much earlier in the growing season it is very possible for apple maggots to hatch and find something other than an apple on which to lay eggs. If you are a serious grower or just a weekend gardener but you want to protect your plants, the first thing you need to do is place out APPLE MAGGOT TRAPS. These are glue type traps which resemble an apple (a range of fruit actually) and should be hung on or around any plant you want to protect. These traps come with a powerful scent (lure) which is sure to attract adult apple flies which hatch looking for fruit and plants on which to feed. The round shape of the traps seem to have an impact on just how well they work. Plan on using one trap per tree. Each “set”comes with 3 “fruits”, glue for each one and lure. Lures will remain active for 30-60 days. Traps can be renewed by adding new lure every 60 days. Sold in 3 packs, use one lure per “apple”. Since apple maggot adults will be targeting fruit on which to lay eggs, its only natural that they’ll be attracted to the placement. Place traps out in early spring – certainly before bud break. Once installed, monitor traps no less than twice a week looking for captured adults. Once you find apple maggot flies, consider treatment options. Remember, apple maggots will tend to be active around plants which provided them with food the preceding year. This means they are most likely to follow the schedule of the plants you are growing. However, if there are other plants close by which generate fruit at different times of the year, it is possible you could get adults flying much earlier than anticipated. For this reason you may have to monitor much earlier than expected as well as treat more than a month or so in the fall. It is entirely possible that early berries growing could trigger adults to hatch and start to establish themselves and if this happens you could be in for a long season of damage and disappointment. Treating for apple maggots is not easy. Conventional liquid sprays are not effective once adults have been established since they lay eggs in the fruit. Eggs are protected so liquid treatments may impact some adults which alight on host plants but this impact is generally not enough to keep them from laying eggs before they succumb to the treatment. With the use of Maggot Traps you are now able to identify just when adults are active and since they won’t start laying eggs for a couple of weeks, you can then put in place liquid treatments which will help. This can happen since adults will forage to host plants looking for honeydew, sap and other nutrients on the plants foliage. But if you treat these plants prior to egg laying, adult apple maggots will be “trained” to look elsewhere and in turn, be much less likely to lay eggs on your trees. When spraying for apply maggots, its very hard to effectively treat them directly, when they’re doing damage. Remember, they use their “sting” to insert eggs on fruit. And they can forage to different plants throughout the day so adults won’t be sitting ducks prior to egg laying. But there are two products which can help fight the problem. The first product is organic using nothing but pyrethrins for an active. 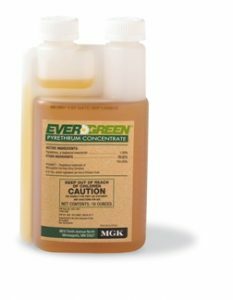 EVERGREEN PYRETHRIN CONCENTRATE will kill most any garden pest quickly and it will keep them off treated foliage for a few days. But it has limits. Pyrethrin can be applied safely to developing fruit and even harvested fruit without posing a hazard or danger to anyone consuming the produce. The big problem with pyrethrin is that it doesn’t last. So after you spray it, the active begins to break down and is generally gone within the hour of being applied. This means you get no true residual protection so plants will be vulnerable soon after they were sprayed. But pyrethrin is highly repellent to insects, even in trace amounts, so you will derive benefit when spraying. Use 1/4 to 1/2 oz per gallon of water and plan on getting 500 sq/ft of coverage per mixed gallon when spraying the mixture as a liquid. For 5-10 times the coverage, consider using one of the foggers listed below. These devices will disperse the treatment over a much larger area dramatically reducing the amount of product needed as well as the amount of time needed to treat. When needing to protect a few trees, liquid applications will suffice. But if you have a full orchard to cover, fogging will be the way to go. If you want something to provide a lasting residual and repel insects, go with PERMETHRIN CONCENTRATE. This product should be applied in early spring before eggs hatch. Be sure to spray tree bark, limbs and the ground under the drip line. Treatments will last 2 weeks and protect trees from hatching larvae. Once in place, this active will also chase adult flies foraging around looking for a place to lay eggs. Spray trees up to petal fall and the residual action of the active will continue to work for 2+ weeks keeping flying pests away. Add 1/4 to 1/2 oz per gallon of water and plan on getting around 500 sq/ft of foliage protection per mixed gallon. Like the pyrethrin spray, fogging will provide 5-10 times as much coverage and do so in a fraction of the time it takes to spray a liquid. Treatments done in early spring and up to petal fall should keep your tree protected but if you want to treat apples as they grow, use the Pyrethrin above since it allows for directly treating growing apples with just “1 day to harvest”. 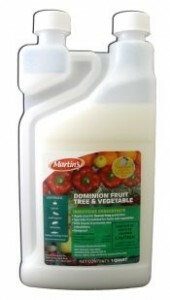 For systemic protection, you can also apply DOMINION FRUIT TREE SYSTEMIC. This product can work as a systemic for 1-2 months of control but it can also be sprayed on foliage too. Dominion works slowly compared to Vegetables Plus so don’t expect targeted pests to die in a day. But within 2-4 days, the tree will be free of destructive pests and well protected moving forward. For active infestations, using both the Vegetables Plus for fast relief combined with Dominion is the way to go. But if its early in the season or if you’re treating just to be sure you don’t develop a problem, using the Dominion alone will do the job. For systemic protection of any fruit bearing tree, use add 2 oz of concentrate for every 10″ of tree trunk width. To make the application, you’ll need a 5 gallon pail. Fill it with 3-4 gallons of water, add the 2 oz of concentrate and then apply it to small holes you make around the tree trunk inside the “drip line”. The drip line is an area close to the trunk, not further then the expanse or width of the tree limbs that grow out. Usually its within 4-8 feet of the trunk. The holes should be spaced a couple of feet apart and you should make 8-10 holes, 1/2″ wide and 10-15″ deep. Pour the mixed product from the pail into the holes making sure the ground absorbs the product. This will allow the roots of the tree to absorb it and in turn, distribute the active to all the foliage so that any insect attempting to eat foliage or leaves will die. You can also mix 1 oz per gallon of water and use the mixture as a surface spray. Treatments will last 2-4 weeks and will kill foraging insects like apple maggots. When using either of the products above, you have a range of sprayers that can be used. For small jobs, our standard PUMP SPRAYER will work fine. When pumped enough, it can reach 15-20 feet so if your tree isn’t too tall, this unit can handle the job. If your tree is tall and you have strong water pressure coming out of the garden hose, go with our HOSE END SPRAYER. This sprayer can handle enough concentrate and water to spray out 20 gallons of mixed material. 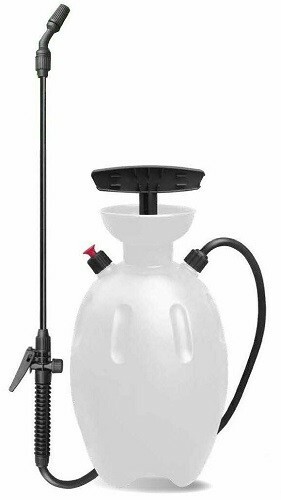 The great thing about this sprayer is that it mixes the chemical and water for you so basically all you have to do is add the concentrate to the tank, add some water, hook it to your hose and spray. 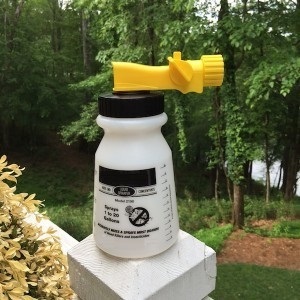 So when using either of the products above, you’ll need to add 1-2 oz of either concentrate and then enough water to fill the sprayer to the 5 gallon line (the outside of the sprayer is clearly marked 5 gallons, 10 gallons, 15 gallons and 20 gallons). You’ll then hook it to your hose and using the little “off/on” tab you can see on top of the handle, you’ll be using the power of the your garden hose to treat. For most people, this is a good option assuming you have garden hose that can reach your trees. Now if you have tall trees and do not have a hose long enough to reach them, go for the TROMBONE SPRAYER. This sprayer can reach 30+ feet. It works as the name implies; like the musical instrument known as the trombone. You will need to “premix” product in a pail (a 1 gallon pail will work but for most, using a 5 gallon pail will be more efficient). In the pail you’ll add the chemical and water and then you’ll need to carry the pail out to the trees you want to treat. The sprayer comes with a long hose you’ll drop in the bucket and then using a “trombone” like pumping action, you’ll be able to spray the mixture up and onto your trees. Another great way to apply either the 6% Pyrethrin or the Vegetables Plus Permethrin is by fogging. This process involves using machines that will “change” the liquid to a mist. When mist blowing, you’ll do a much better job of covering all the tree foliage because the mist blankets all surfaces and essentially won’t miss anything. The other huge advantage is that on average, you’ll use at least 75% less chemical and be able to do so in a fraction of time compared to liquid spraying. For small jobs, the FM6208 is electrical and features a 1 gallon tank. It can reach up 25-35 feet and can handle 1/2-1 acre of trees comfortably. 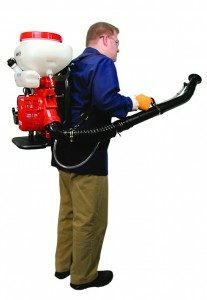 If you prefer to “cut the cord” and need to walk 1/2 to a few acres, the HUDSON MIST BLOWER features a gas engine and a 3 gallon tank. 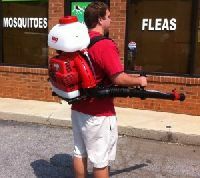 It will spray the mist a good 30+ feet and is well suited for the orchard care taker managing 1-2 acres of trees. 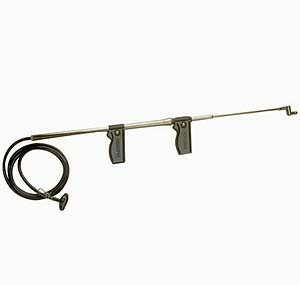 The SOLO MIST BLOWER is essentially the same type of equipment but is considered the “Cadillac” of mist blowers. Its more comfortable to use compared to the Hudson and can blow the mist 45+ feet up. It features a super quiet Honda motor and does not vibrate nearly as much compared to the Hudson. All of the machines above can be used with water as the chemical carrier and will empower the user to manage 1-3 acres comfortably. But if you have more than 5 acres to treat, consider one of the thermal foggers listed below. For large scale operations, a thermal fogger is the preferred machine to save time and chemical costs. These machines will convert water or oil to a true “ulv” hot fog which means you’ll use even less chemical compared to the “cold” foggers. And they’ll do in even less time. The best handheld option is the TRAIL BLAZER. It can pump out 2.5 gallons of water based material per hour which should be enough to treat several acres. Well suited for any orchard growing any type of fruit, you can drive around your property fogging as you go. But when needed, this unit is light enough to carry. When the solution and fuel tank are topped off, its total weight will be just over 30 lbs. Lastly, for 5-10 or more aces, the truck mounted BLACK HAWK is a 70lb+ monster capable of handling any jog. 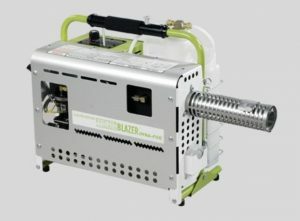 It too features electric start and can pump up to 18 gallons of mixed solution per hour (oil based). Optional water base “converting” kit is available. It seems to me that a soil drench or dust would help control the apple maggot emerging pupae, but you do not mention that. Is it because its ineffective? If it does work, use permethrin, sevin, or? Thanks. Soil drenching won’t help. Basically the emerging pupae are flying and not crawling so they mostly miss the application so its not an effective approach. what about attacking them when they have not hatched yet by turning over the soil and rolling it – disturbing them and killing many off – does that work? Sorry but no. Like most any insect, their pupae are impervious to insecticide. True, the feeding larvae are vulnerable on the tree and when they first land on the ground. But within a short period of time, they’ll form their protective pupae coccoon and once inside, remain safe until they hatch the following spring. And even if the soil is treated when they emerge to leave, most won’t pick up enough chemical to be affected so they’ll fly off to live a normal season.